We really would love to feature regularly your offerings and any events you may trade for FREE across our popular social pages to 10,500+ genuine vintage, retro, upcycled & handcrafted followers! Plus you can dual list items from other sites you may sell e.g. ASOS, Etsy, eBay, Depop, Facebook and your own, and simply refer customers there with a web-link to Checkout. You can also use the no tie-in FREE Trial to give an extra shout out on your Online Vintage Fair Stall about any Special Offers or Sales you run elsewhere! Showcase your offerings & any events you may trade - attract more customers! 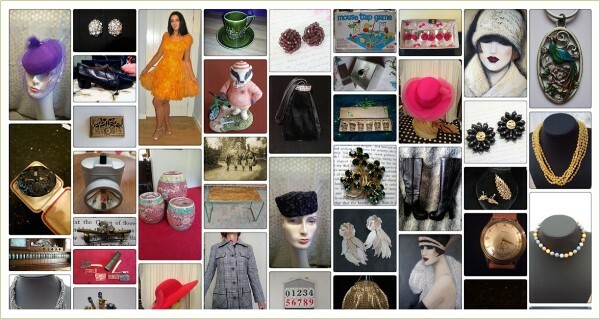 Advertise your Online Vintage Fair Stall URL on business cards etc. Vintassion extensively features your offerings and any events you may trade through its weekly UNCOVERED Newsletter and social media using Facebook, Twitter, Pinterest, and Instagram; where we have a growing 10,500+ genuine followers! You too can easily promote your offerings and any events you may trade using the social share buttons (Twitter, Facebook & Pinterest) automatically included with each listed item and event. Any renewal starts at the end of your Selling Period or starts on the day of renewal if you have let your Selling Period lapse. Either way all your previous item listings and Online Vintage Fair Stall set-up will be carried through whenever you choose to renew your Selling Period. If at any time during and after the Free Trial you kindly recommend Vintassion to another seller please email us their name, and for each seller you refer who takes up the Free Trial and starts listing we will automatically extend your Selling Period for 30 days together with any Supporting Promotions you are running at that time. Both UK and overseas based Sellers are welcome. When overseas Sellers register they are required to enter their, Country in place of a UK "County" and their Country's equivalent to a UK "Postcode". You can also use the social share buttons on your item listings to easily share and promote them on your preferred social pages (Facebook, Pinterest & Twitter) and you can pin item listings to our Group Pinterest Boards, both for items you have listed on Vintassion or elsewhere, like ASOS, Etsy, eBay, Facebook and your own website. In addition, we work continuously on improving our search engine optimisation, including getting our website link registered with vintage affiliated websites. You will be able to see the direct impact of our marketing campaigns on your listings through seeing how many times your listings are viewed from your seller’s account. 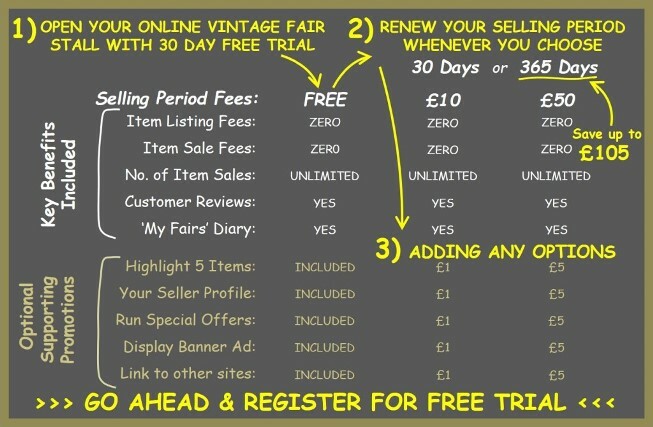 For more details on running your Online Vintage Fair Stall and optional supporting promotions please click here. If you have any queries whatsoever please do not hesitate to get in contact. We wish you every success and look forward to helping you promote and enjoy selling more vintage, retro, upcycled & handcrafted.